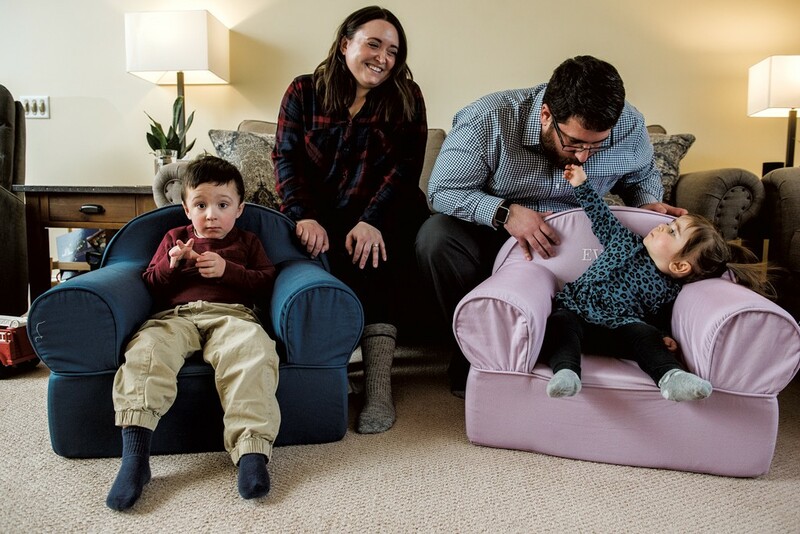 Brittany, Jeremy, Henry & Evelyn | Parent Portrait | Kids VT - small people, big ideas! Brittany: A week before Evelyn was born, Henry was diagnosed with autism. He was 2 1/2. The school system has been great; we met with them early on and figured out options for Henry. He goes to Orchard School in South Burlington a few days a week now, and then both kids are with Jeremy's parents when we're working. He has service providers who work with him one-on-one at my in-laws' house during the week. (Jeremy and I) both work full time, but we try to spend as much time together as a family as possible. Jeremy: Before dinner, we usually go for a walk. This is the time of year that we start trying to get everyone outside again as much as possible. Henry loves being outside, and exercise really helps keep him focused. Jeremy [as Henry climbs on his shoulders]: He loves climbing and loves to wrestle. So we do a lot of floor time. He loves [it] if we just get on the floor and let him climb on us, and Evelyn thinks that's the funniest thing ever. Jeremy [sitting on the floor, making a giant block tower with Evelyn]: For me, it's this right here. Brittany [as Henry climbs into her lap]: Me, too.